The victor airways are something like the interstate highway system, except that the airways are above the ground and you can't actually see them—they're a system of established routes that run along specified VOR radials, from one VOR station to another. They therefore make flight planning easier, and they help Air Traffic Control to organize and regulate the traffic flow. Virtually all commercial flights are routed along these airways, but they're available for use by any pilot as long as proper altitudes are employed; your simulator flights will therefore be more realistic if you use these airways when you prepare your own cross-country flight plans. The victor airways are clearly marked on official aeronautical charts. They're not shown on the charts that come in the Flight Simulator package, but the major airways that are available on the simulator are shown by the first four charts in chapter 5 of this book. On this flight, from Boston to New York, you'll follow the heavily-used route that employs Victor 451, Victor 139, and Victor 475. 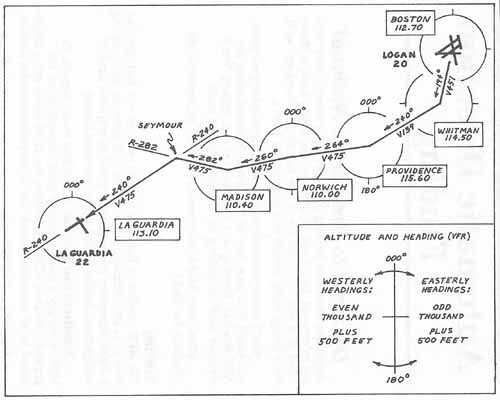 As shown by Figure 3-3, Victor 451 runs from the Boston VOR to the Whitman VOR; Victor 139 is from Whitman to Providence; and Victor 475 runs from Providence through Norwich and Madison to La Guardia. Although you haven't previously used the victor airways, the procedures that are involved are ones you've followed many times before. There are just two minor variations from what you've done on previous flights. Instead of staying on the same radial as you pass each station, you'll have a small change in course each time you proceed from one leg to the next. There's a point on the last leg of this flight where the airway bends at an intersection of two different radials. This point is identified on aeronautical charts as Seymour Intersection; you'll need both NAV receivers to identify that point, but there's nothing really new about the procedure. Altitudes. Since this is a long flight, it's desirable to climb to a higher altitude than you've flown previously. It's more economical on fuel; you avoid a lot of local VFR traffic; and, in any event, the view is better. However, there are rules regarding altitude for cruising en route on VFR flights. Easterly Headings. If you're flying VFR and are above 3000 feet, then on easterly headings (between 000° and 180°) your altitude should be an ODD thousand plus 500 feet (3500 feet, 5500, 7500, and so on), as shown in Figure 3-3. Westerly Headings. Conversely, on VFR flights above 3000 feet with westerly headings (180° to 360°), you use an even thousand plus 500 feet (4500 feet, 6500, and so on). Therefore, if you want to cruise above 3000 on this VFR flight, 4500 is the next allowable level. That's what you will use. Departure. Depart Logan on Runway 22 Right; then, shortly after takeoff, pick up the Whitman 194° radial, which you'll track inbound to Whitman as you climb to 4500 feet. Checkpoints. Except for Seymour Intersection, all checkpoints are passages over VOR stations, but on this flight your outbound heading from each VOR will be a bit different from the heading you flew inbound. Therefore, as you approach each checkpoint, watch for station passage—when the needle moves temporarily to the side; the flag changes from to to from; and the DME readout falls to zero. At that point, note the time; turn to the new outbound heading; and then switch NAV-1 to the next VOR and set the omni bearing for the radial you'll track inbound to that station. For example, as shown by Figure 3–3, you'll arrive at the first checkpoint (Whitman) on the 194° radial with a heading of 194°. As you pass that station, you'll first note the time, then will turn to the new heading of 240°. Once you're on that heading you'll switch NAV-1 to Providence, set the omni bearing to 240°, and make any adjustment that's needed to get the needle centered. You may find it helpful to put NAV-2 to work to help you make the transition from the inbound to outbound course at each station passage. Set NAV-2 to the same frequency as NAV-1, but set the NAV-2 omni bearing to the outbound heading. At station passage NAV-2 will then serve as a temporary reference until you've turned and switched NAV-1 to the next VOR. Final Checkpoint. The last checkpoint is Seymour Intersection, a point where the 282° radial you are tracking from Madison intersects R-240 to the La Guardia VOR. As you track outbound on Madison R-282 using NAV-1, just set NAV-2 to La Guardia's 240° radial. Then keep the NAV-1 needle centered while monitoring NAV-2, and when the NAV-2 needle is also centered, turn left to heading 240° to track the La Guardia radial inbound to the airport using NAV-2. Once you're set up on the inbound radial using NAV-2, you can then transfer the NAV-2 settings to NAV-1, so that the DME will give the distance to the airport (instead of the distance back to Madison). However, trying to describe the procedure in words makes it sound more complicated than it actually is. Once you get into the air, you'll have plenty of time to think about each step as it arises. The set-up parameters and the flight plan are given below. Departure. Use the overhead view to locate Runway 22 Right, then taxi into position and take off. On climb, visualize the Whitman 194° radial (to which NAV-1 is set), and then maneuver to intercept it and track it inbound to the station. Continue climbing to 4500 feet. Re-set NAV-1 to Providence (115.60). Set the NAV-1 omni bearing to 240. Make any course adjustment needed to center the needle. Then figure our ETA for checkpoint 2 (Providence). Checkpoint 2. Providence. At station passage again note the time; then turn right to heading 264°. Re-set NAV-1 to Norwich (110.00); set the omni bearing to 264; center the needle; and figure your ETA for the next checkpoint. Checkpoint 3. Norwich. The new (outbound) heading is 260°, and the new NAV-1 setting is Madison (110.40), R-260. Checkpoint 4. Madison. The new (outbound) heading is 282°; NAV-1 remains set to Madison. Change the omni bearing to the outbound radial, R-282. When established on the outbound radial on heading 282°, tune NAV-2 to La Guardia (113.10), and set the NAV-2 bearing to 240°, to pick up the next and final checkpoint. Checkpoint 5. Seymour Intersection. As you proceed outbound from Madison with the NAV-1 needle centered, the NAV-2 needle will eventually begin to move. When it is just about centered, note the ATA at Seymour; turn left to heading 240°; then switch your primary attention to NAV-2 to get its needle centered. When established on the 240° radial inbound to La Guardia, re-set NAV-1 to the same frequency and radial, so that the DME will give you the distance to La Guardia. Approach. Set up for the approach before you're 15 miles out; at 15 miles DME, begin a descent to 2000 feet. You're cleared for a straight-in final to La Guardia's Runway 22. Level off and maintain 2000 feet until you're 6 miles DME from the airport; then begin your descent on final and get lined up with Runway 22. Your heading will be 220°.